The Isle of Skye is one of the most dramatic places in the UK for photography. The southern part of the island is dominated by the Cuillin Hills – not sure why they’re called ‘hills’ as these are some of the most epic mountains in the whole of Scotland. 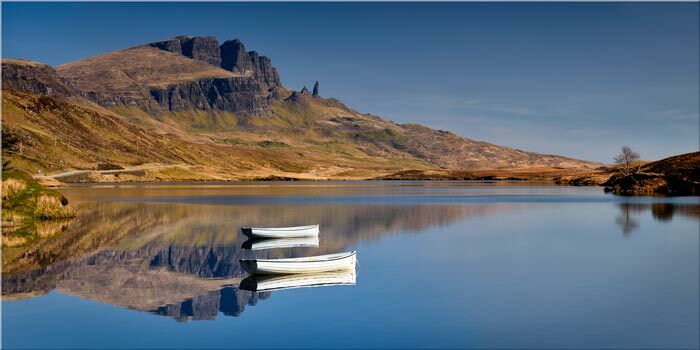 In the northeast of the isle is Trotternish which includes the Quiraing and the Storr, huge rock stacks and cliffs formed by large land slips creating some unique landscapes. Over on the most westerly tip of the Isle is Neist Point Lighthouse. A view point high on the cliff tops gives wonderful views over the golden cliffs to the Lighthouse on the tip on the mainland. With high resolution, single panel Cornwall canvases up to 7ft wide and multi-panel canvas prints up to 13ft wide. Photographs from all around The Isle of Skye in Scotland. Beautiful single and multi-panel canvas prints of the Isle of Skye.